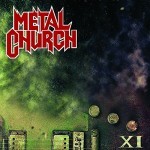 Share the post "Album review: METAL CHURCH – XI"
Metal Church are back and they bring the incredibly impressive XI. This is your typical thrash release from Metal Church, and that’s not a bad thing. Formed in what is known as Thrash’s golden era Metal Church have ingrained themselves as Thrash geniuses through their piercingly vocals and insanely tight musicianship. At a first glance, this album blew me away. Killing Your Time, hits the mark every time. One thing I can’t get over throughout this album is Mike Howe’s vocals, they seem to be limitless and are extremely unique given the genre which tends to prize rougher vocalists or extremely high pitched vocalists this is a unique blend which I feel many bands overlook or even lack these days. The sheer flexibility in vocals can be seen from the evil sounding roughs of ‘Reset’ (which reminds me of Megadeth to be honest!) to the ear rupturing highs of ‘Suffer Fools’. This should come as no surprise however, Howe is no newcomer to the genre began his career with Snair and then joined speed metal outfit Heretic. Howe however found his stomping ground with Metal Church where he has fully asserted his dominance on the genre. XI will be the bands first release with Howe since his departure 20 years ago with his last release with the band Hanging In The Balance (1993). The first track on the album ‘Reset’ like previously mentioned reminds me a lot of some of Megadeth’s material especially vocally. The song starts with a beautiful riff and opens up into a stunningly worked piece on the whole. This entire song is driven, fierce and fiery. This has to be one of my favourite songs from the album and Metal Church have seriously put their best foot forward first with this song. We then have ‘Killing your Time’, another song which really took me by surprise. This song for me is up there in particular for its guitar work and insane solo which not only flows well but manages to still be surprising. It’s brilliant that Metal Church have managed to still encapsulate an old school vibe to their music, this song again reminded me of another band this time, Iron Maiden. Especially with its intro and vocals which just scream out Bruce Dickinson. ‘No Tomorrow’ opens in a manner no one would’ve expected with the solo strumming of an acoustic guitar, this song fires up into a real cracker though with the powerful vocals, now clearly a running theme throughout this album driving the song upwards and onwards. ‘Signal Path’ and ‘Sky Falls In’ both clock in at over 7 minutes long, each. The latter to me is the more interesting of the songs through its capturing introduction and ridiculous guitar work. The piece is weighted well in terms of tempo and could even be described as progressive more so than thrash. The solo is right up there with some of the best Metal Church have done and is a break away from your typical thrash solo of hitting random notes (Slayer!). This album has a few more brilliant songs such as ‘Soul Eating Machine’ which contains a really catchy riff which grabs you from the get go, ‘It Waits’ with its very eerie beginning which opens up slower than most songs on the album but again showcases the variety of this album and finally the insane ‘Blow Your Mind’ which is probably one of my favourite songs from this album, talk about self describing! This entry was posted in ALBUM REVIEWS, ALBUM REVIEWS (Mobile), All Posts, PURE METAL (All posts), Pure Metal/Album reviews and tagged album, metal, Metal Church, Mike Howe, Nuclear Blast, review, XI. Bookmark the permalink.